The Presidential Commission on Good Government (PCGG) presents a quandary for every new administration. The agency’s obsolescence is so palpable that many has sought its abolition, which is also among the pledge that helped put Noynoy, of his “straight path” crusade, in Malacañang. Then comes the day Noynoy is president and suddenly the PCGG abolition is under review again. Lately, the Palace has issued an executive order directing the PCGG to order its nominees, who are presumably holdovers from the previous administration, to vacate their positions among sequestered firms. They will be replaced by new appointees, all allies of Noynoy. Malacañang’s logic truly escapes me. Just the other day, still reacting to the plea bargain deal entered into between the Ombudsman and retired Maj. Gen. Carlos Garcia which was approved by the Sandiganbayan, Noynoy’s mouthpiece Edwin Lacierda was quoted as saying that the plea bargain must be scrapped, even after the Sandiganbayan approved it, and despite the fact that the principle of double jeopardy stands in the way. But the Palace insists on this being scrapped because it sends a wrong signal to government officials to steal, since they can always plead guilty to a lesser offense of graft, by forging a plea bargain deal with the Ombudsman. But Noynoy and his boys, claiming that they are outraged at the anti-graft justices’ decision to uphold the plea deal, continue to make it a big issue. MANILA – Editha Balolong is just 28 years old and yet she already has six children. 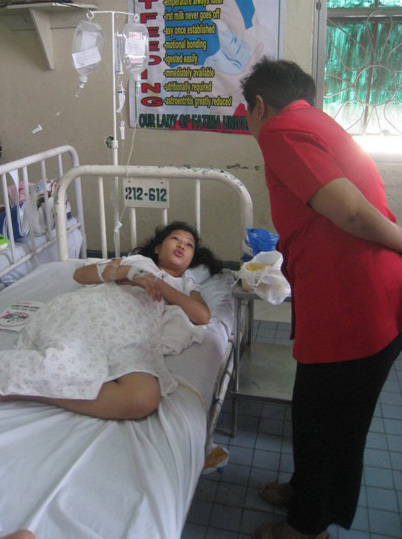 She gave birth to her sixth child at Dr. Jose Fabella Memorial Hospital last May 3. She was supposed to have a tubal ligation after giving birth but she was advised to come back on June 14th instead because of bleeding. “I worried over our bill. I already had two blood transfusions,” Balolong lamented. The two bags of blood she was given amounted to at least P1,000 ($23). Balolong had to stay in the hospital from May 3 to May 7. Her husband is “just a pedicab driver earning P250 a day($5.81).” They have five other children to feed; two to send to school. Balolong is a housewife. “No one would look after the kids if I go off to work,” Balolong told Bulatlat.com. She and other mothers from the marginalized sectors are in need of accessible and affordable reproductive health services. House Bill 4244 or the Responsible Parenthood Bill, also called the Comprehensive Reproductive Health Bill, the bill so maligned by the influential Catholic Church and pro-life advocates, would have provided funds for implementing health service programs if passed. It will make available what mothers like Balolong sorely needed. To help mothers like Balolong, the Gabriela Women’s Party (GWP) provided medical assistance to 100 mothers who gave birth during Mother’s Day last May 7 and 8 at Dr. Jose Fabella Memorial Hospital. The P1,000 ($23) medical assistance came from GWP’s Priority Development Assistance Fund. According to GWP, for the year 2011 the government budget on health services allocated P351 ($8) for every woman or a meager P0.96 per day. With 11 mothers dying everyday due to complications arising from pregnancy and giving birth, GWP has vowed to steadfastly campaign for enacting HB 4244. Recently the Catholic Church has ended its talks with Malacañang saying President Benigno S. Aquino III has decided that he will support the passage of the RH Bill. GWP Rep. Luz Ilagan, on the other hand, said that instead of turning its back on dialoguesthe Catholic Church should review their hard-line stance and take a closer look at the needs of their flock. “The Catholic Church leadership has long admitted that there are some among their ranks who favor the RH Bill. This is largely because priests and lay people who are grounded and closely working with the poorest communities are aware of the urgency of having a national policy that will ensure the delivery of health services to many Filipino women and their children. They know that the absence of an RH policy endangers the lives of women and their children especially during pregnancy and childbirth,” said Gabriela Rep. Ilagan. The solidarity mission went to Pantabangan to document the conditions of the Igorot community who are being displaced from the land they have been tilling. The team did not expect that they would experience what the Igorots have to put up with in their struggle for land. PANTABANGAN, Nueva Ecija — Early morning of May 2, I rode a bus to Cabanatuan City to join a solidarity mission organized by Alyansa ng Magbubukid sa Gitnang Luson (AMGL). The mission aims to conduct an investigation on the conditions of an Igorot community being displaced by projects under a public-private partnership project. On board two jeepneys from Cabanatuan City, the team, composed of some 30 individuals from peasants, indigenous peoples, human rights groups and church-based organizations, went straight to Pantabangan Municipal Hall in Nueva Ecija for a courtesy call with the local mayor. After waiting for more than an hour for a certification from the mayor, we travelled for more than an hour and reached Lower Tuli subvillage, Villarica village shortly before dark. Two local radio journalists, both women, joined us. Hanging in one of the huts was a banner with the words: “Welcome, Bayanihan Program. Mamulat, Makiisa at Makialam para sa Mapayapa at Maunlad na Lipunan.” On another hut was a banner of the Spartans of the 81st Infantry Battalion of the 7th Infantry Division of the Philippine Army based in Sto. Nino 2, San Jose City, Nueva Ecija. At that moment, I was holding a camera, taking photos. Canedo looked at me and asked for my identification. He held my press card and read my name aloud. He asked what Bulatlat is and I answered. Canlas said I am not the only journalist in the group and that we were invited to cover the solidarity mission. Not long, a man wearing a cap and a shirt with the words “I Heart Peace” joined us. He introduced himself as Capt. Elmar Salvador, commanding officer of the Spartans team. Immediately, he patted the back of one of the male members of the delegation and told him: “I heard what you said to Tatang (old man) earlier. Your words were striking.” Later on, I would learn that the delegate told the old man that there is no change under the new administration. Canlas went on explaining that the mission wanted to interview the residents regarding their land problem. “Go on. I will not meddle with you,” Salvador said. Salvador said they are there for the Bayanihan program initiated by the chief executive. “We want to experience how to live as normal Filipino citizens, that we also belong to society,” he said. He went on saying that they are there to organize the community. The conversation lasted for a while until the leaders of the solidarity team ended it. Before dusk, I and two other members of the team saw two soldiers in full battle gear, brandishing long firearms, roaming around the community of less than 50 households. Another member of the team, the driver of one of the jeepneys, said he saw at least 30 soldiers, also in full battle gear, not far away from the center of the community. The solidarity mission team decided to stay for the night. The road back to the town proper is dangerous. We occupied the small wooden church of the United Church of Christ in the Philippines (UCCP), a few meters away from where the soldiers were staying. MANILA – The immoral and unpatriotic act of the Sandiganbayan justices must be condemned. This was the reaction of Pagbabago! People’s Movement for Change spokesman Fr. Joe Dizon, to the approval by the Sandiganbayan of the plea bargain agreement with retired AFP comptroller Major General Carlos Garcia last Monday, May 9. It will be remembered that Garcia and former Ombudsman Ma. Merceditas Navarro-Gutierrez struck a plea bargain agreement wherein the government commits to withdraw plunder charges in exchange for a guilty plea for the lesser offense of direct bribery. Because of the deal submitted to the Sandiganbayan for approval, Garcia was allowed to walk out of his Camp Crame detention cell after posting a bail of P60,000 ($1,395) on December 18 last year, two days after he pleaded guilty to direct bribery during his re-arraignment for that lesser offense. Lawmakers actively involved in the congressional investigations into Garcia’s case are also vehement in their protest against the Sandigabayan decision. They said that the Sandiganbayan violated its Constitutional mandate. “The Constitution mandated the Sandiganbayan to give life to the fundamental principle that public office is a public trust, through the prosecution of civil and criminal cases involving graft and corrupt practices and other offenses committed by public officers. Sandiganbayan Second Division unanimously, but suspiciously and hastily, approved the plea bargain agreement. It previously denied Garcia’s petition for bail on the charge of plunder, thereby declaring that the evidence of guilt was strong. In a turn-around, however, it justified its latest decision to approve the plea bargain by declaring that the prosecution’s evidence was weak. This decision is prejudicial to the interest of the Filipino people,” Bayan Muna Rep. Teddy Casino said. 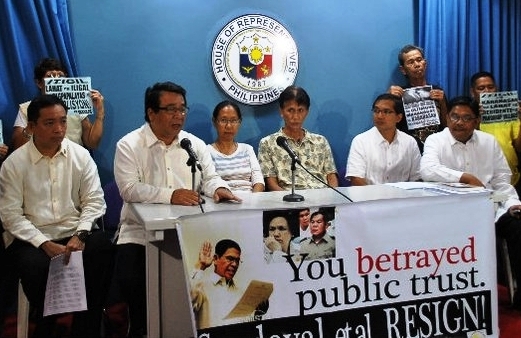 Casino and other lawmakers in the progressive bloc of the Makabayan Coalition — Bayan Muna Rep. Neri Colmenares, Anakpawis Rep. Rafael Mariano, the two Gabriela Reps. Luz Ilagan and Emmi de Jesus, Kabataan Rep. Raymond Palatino, and Alliance of Concerned Teachers Rep. Antonio Tinio — are calling for the resignation of Sandiganbayan justices. namely Presiding Justice Edilberto Sandoval, Justice Teresita Diaz Baldoz and Justice Samuel Martirez. 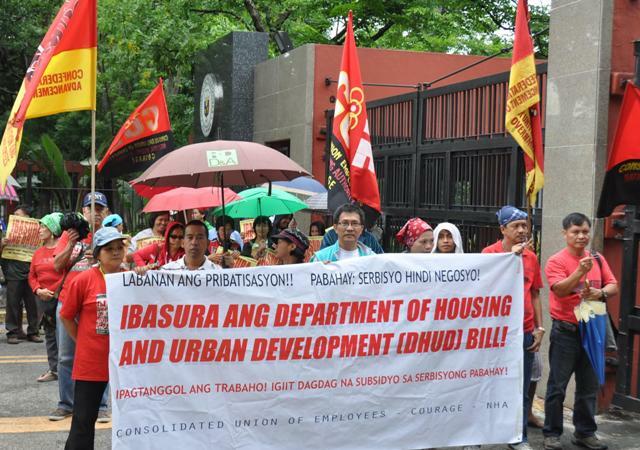 MANILA — Employees of the National Housing Authority (NHA) are against plans of the Benigno Aquino III government to privatize housing services and to create a Department of Housing and Urban Development. They were joined by residents from urban poor communities in Quezon City and Metro Manila in a protest last May 8 in front of the House of Representatives. Rosalinda Nartates, president of the the Consolidated Union of Employees-NHA is adamant in protesting against the proposed agency, saying that it is all part of a privatization scheme. Public housing under the proposed DHUD, she said, will become more profit-oriented than it already is. NHA employees and urban poor organizations under the Kalipunan ng Damayang Mahihirap (Kadamay) have been fighting against moves to privatize public housing and legislative proposals on the same since the year 2000 and since the 9th Congress. Nartates also said that their stand against the DHUD also had to do with the proposed reorganization of the seven key shelter agencies. In the line of fire are the jobs of at least 5,000 employees. The proposed DHUD is among President Aquino’s 12 priority bills that he presented to the Legislative-Executive Development Advisory Council (LEDAC) in its February meeting. Executive Secretary Paquito N. Ochoa Jr said that the bill is among the four “Human developments bills” the Aquino administration is determined to have passed into law. To be merged are the Key Shelter Agencies (KSA)—Housing and Urban Development Coordinating Council (HUDCC), Mutual Fund Development Corporation (PAG-IBIG fund), Home Guarantee Corporation, Housing and Urban Land Use Regulatory Board (HLURB), National Home Mortgage and Finance Corporation and the NHA.The NHA is the government’s lead agency and corporation engaged in direct shelter provision. “The number one threat to Filipino health and job security is the US-Aquino Regime,” whose PPPs “result in privatization, in the abandonment of health as a right of the people, and in denying health workers decent wages and jobs.” – Health Alliance for Democracy. MANILA— “Other people including graduates of ‘mere four-year-courses’ are earning higher salaries than me,” said a trained surgeon working for years now at a district hospital in a province north of Manila. He said that lack of doctors in their hospital has also forced him to work on “all kinds of cases and not just on an operating table.” Today, he admitted that he is applying for a job abroad. As a surgeon, he thought his career is also in danger here as a new regulation is “being cooked up” by the PRC (Professional Regulations Commission) in Manila requiring people like him to become member of a certain society of surgeons first, before he can renew his license. Still, this doctor went to Manila and braved the scorching summer heat to join his colleagues from different hospitals and practices in commemorating the National Health Workers’ Day last May 7. The Health Workers’ Day main program peaked at high noon at the Mendiola Bridge. 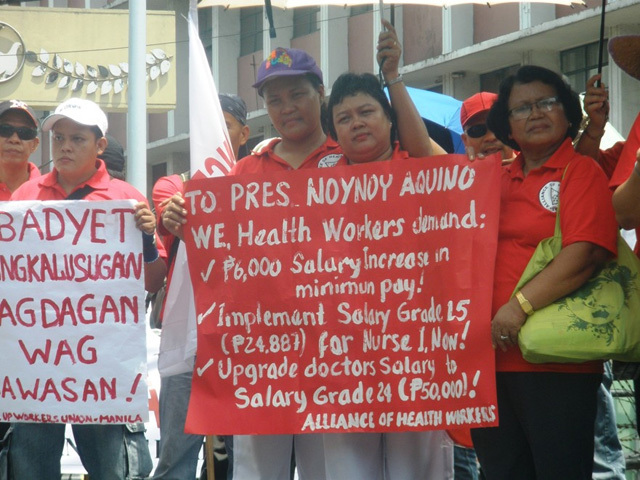 Almost a year into Aquino’s presidency, health workers complained they “still suffer from low salaries, inadequate benefits and understaffing,” a plight some of them had thought would change under President Benigno “Noynoy” Aquino III. 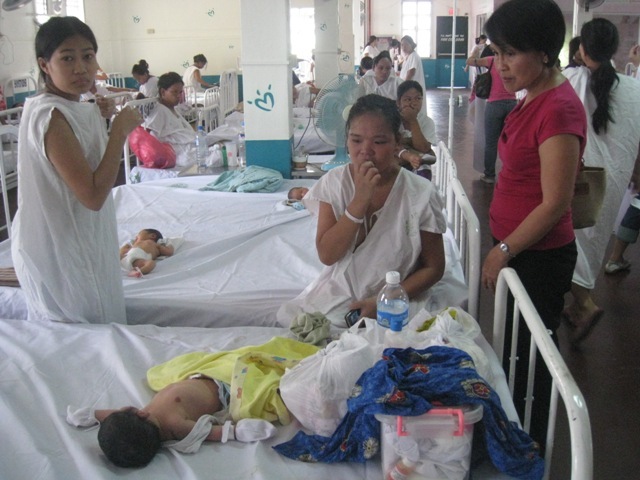 In his election campaign, Aquino was reputedly the only candidate who had promised to take care of public health. But today, a year into his presidency, a bigger allocation of the public purse has been going to militarization and debt servicing rather than public services such as health, said the health workers’ groups. To finance health, Aquino increasingly turns to PPPs (public-private partnerships), which, the health workers’ groups said, are treating health services as “profitable” ventures rather than public services. They said the PPPs make health services available but costly to average Filipinos. President Aquino and leaders of the Catholic Church appeared to have burned their bridges over the Reproductive Health (RH) bill debate after Aquino threatened to file sedition charges against the Church-backed critics of the bill who will call for civil disobedience while bishops welcomed the threat and described Aquino as sounding like former President Ferdinand Marcos, the political nemesis of his mother former President Corazon Aquino. Aquino said anybody who plans to join pro-life non-government organizations’ (NGOs’) reported bid to launch a civil disobedience campaign by refusing to pay their taxes once the controversial Reproductive Health (RH) bill is enacted by Congress may face sedition charges. Aquino told reporters during a visit to the Department of Environment and Natural Resources (DENR) that anyone who threatens not to honor tax liabilities constitutes a very serious offense which is punishable under the law. Human rights abuses persist under the administration of President Aquino while hundreds of cases of rights violations committed under the previous administration remain unresolved, London-based Amnesty International (AI) said in its latest Report 2011. Amnesty International Philippines director Aurora Parong said extrajudicial executions by security forces and armed groups belonging to political clans continue with impunity. She added almost no perpetrators of more than 200 cases of disappearances and at least 305 extrajudicial killings during the term of former President Arroyo have been brought to justice. State seismologists recorded at least 11 volcanic quakes around Taal Volcano in Batangas and Mayon Volcano in Albay in the last 24 hours. According to the Philippine Institute of Volcanology and Seismology (Phivolcs), both the alert level at Taal and Mayon volcanos remain the same at “2” and “1,” respectively. “Taal Volcano’s seismic network recorded 11 volcanic earthquakes during the past 24 hours,” Phivolcs said in its Friday update for Taal. The death toll brought about by tropical storm “Bebeng” has reached 31 while more than P300 million in infrastructures and agricultural products were destroyed and nearly 500,000 people were affected by the havoc in several regions. Reports from the National Disaster Risk Reduction Management Council (NDRRMC) yesterday showed that Region V or Bicol Region suffered the highest number of fatalities with 24 and 16 came from Camarines Sur; six in Albay, and one each in Catanduanes and Masbate. Regions III, VII and the National Capital Region (NCR) recorded one fatality each while Region VIII accounted four deaths. Nine persons were also reported injured while three remained missing. The gas subsidy is benefiting oil companies more than the jeepney and tricycle drivers for which the program is intended. According to Bayan Muna Rep. Teddy Casiño, the gas subsidy had better be given to the drivers in cash to be spent for the needs of their families rather than an augmentation for their fuel consumption. “On the overhyped ‘additional’ P50 increase in Pantawid Pasada smart cards — Mabuti pang ibigay na lang ng gobyerno ang cash direkta sa drayber para makapahinga sila ng isang araw habang may pambili ng pagkain para sa kanilang pamilya,” Casiño said yesterday. It’s final. The Commission on Elections (Comelec) yesterday confirmed Mayor Alfredo Lim won over former Environment Secretary Lito Atienza by an unprecedented margin during the May 2010 mayoral fight in Manila. The remaining 12,427 votes were spread over the other candidates.